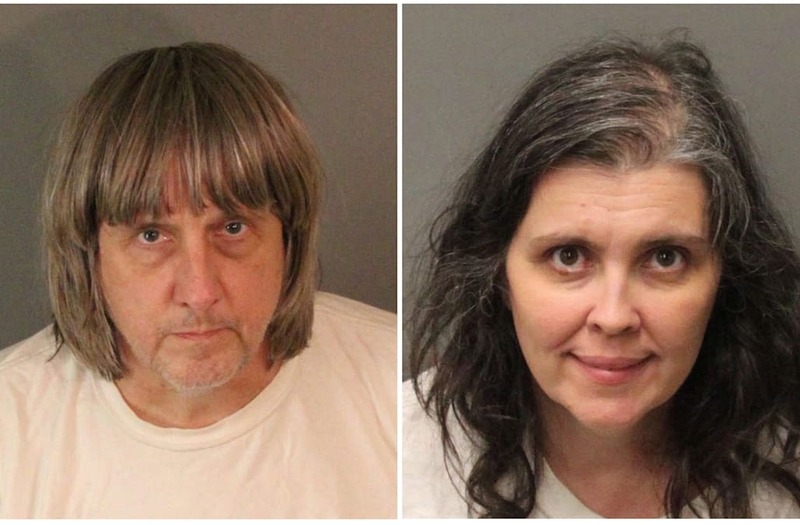 KTLA -- A couple is facing 94 years to life in prison after being charged with several counts of torture, abuse and false imprisonment after authorities reported discovering their malnourished children held captive, some of them chained to beds, in their Perris home, Riverside County officials announced Thursday. David Turpin, 57, and his wife, Louise, 49, were arrested after their 17-year-old daughter escaped and called 911 early Sunday morning. The charges against the couple include 12 counts of torture, seven counts of abuse of a dependent adult, six counts of child abuse and 12 counts false imprisonment. The father was charged with one count of lewd act on a child. Officers dispatched to the home in the 100 block of Muir Woods Road discovered 12 of the girl’s siblings — ages 2 to 29 — some of them shackled to beds with chains and padlocks in “dark and foul-smelling surroundings,” according to a statement from the Riverside County Sheriff’s Department. The victims appeared malnourished and “very dirty,” the statement said.